New York is now officially in line to have the its first Hispanic woman as a Federal District Court judge. President Bush last week sent to the United States Senate the name of Sonia Sotomayor, a 37-year-old lawyer who worked from 1979 to 1984 as an assistant District Attorney in Manhattan, to fill a vacancy in the Southern District, which includes Manhattan, the Bronx and Westchester County. She had been recommended for the position last March by Senator Daniel P. Moynihan. 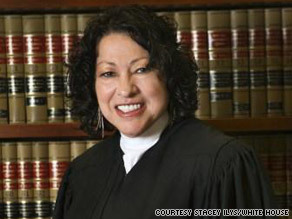 What Ms. Sotomayor has wanted was to be a judge. Next Friday she is to take the oath for a seat on the Federal court of the Southern District of New York, the first Hispanic American to do so. She will also become one of seven women among the district's 58 judges.